ISLAMABAD: Pakistan Tehreek-e-Insaf (PTI) is likely to get 25 reserved seats for women and four for minorities in the lower house of parliament, the provisional results of the elections suggest. 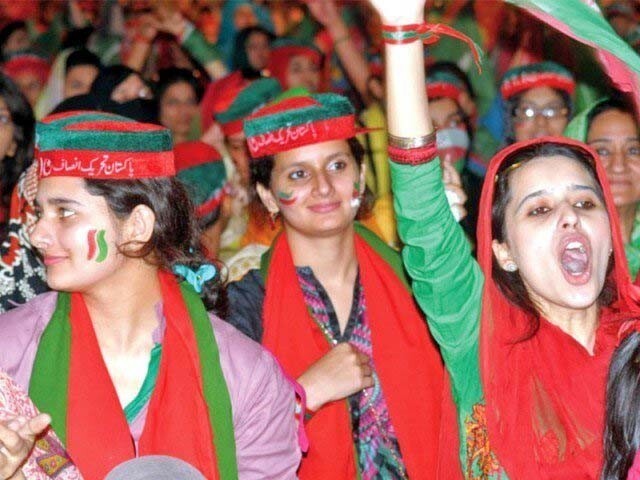 For PTI, the largest chunk of 15 reserved seats for women in the National Assembly (NA) would be coming from Punjab followed by Khyber-Pakhtunkhwa (K-P) with seven seats, and Sindh with three. In 342 NA seats, 60 are reserved for women while 10 for minorities which are distributed among parties under a defined formula [Total NA seats/Reserved seats] and in proportion to their victory on directly contested NA seats in each province. There are a total of 141 general NA seats in Punjab besides 33 reserved for women. A party winning 4.27 directly contested seats from the province is allotted one seat reserved for women. PTI has won 60 NA seats from the province while so far five independently elected MNAs have announced to join the party, pushing its tally to 65. And according to the formula PTI would be allotted at least 15 seats for reserved women seats. The PTI women who would make it to parliament from Punjab – according to a priority list for women reserved seats submitted to the Election Commission of Pakistan (ECP) before elections are Shireen Mehrunnisa Mazari, Munaza Hassan, Andleeb Abbas, Asma Qadeer, Aliya Hamza, Javeria Zafar, Kanwal Shauzab, Dr Seemi Bukhari, Sobia Kamal, Nosheen Hamid, Rubina Jamil, Maleeka Bokhari, Fozia Bahram, Rukhsana Naveed, and Tashfeen Safdar. The remaining three women who are at the bottom of priority list for Punjab – Wajeeha Ikram, Asiya Azeem, and Mashaal Hassan would not be able to make it to the NA. Out of 15, Shireen Mazari and Munaza Hassan were part of the previous assembly, while the rest would be newcomers to parliament. Mazari was declared top performing woman MP in the last assembly. K-P has a total of 39 general NA seats while nine seats are reserved for women. A party winning 4.33 directly contested seats from the province is given one woman reserved seat. Here, PTI has won 30 NA seats while an independent MNA Saleh Muhammad has announced joining the party, pushing the total to 31. PTI would get at least seven women reserved seats in NA from the province. PTI’s priority list for the province suggests Nafisa Khattak, Sajida Zulfiqar, Naureen Farouq Ibrahim, Shandana Gulzar Khan, Dr Rubina, Uzma Riaz Jadoon, Dr Ghazna Khalid would make it to the next National Assembly under PTI share of reserved seats. Nafisa Khattak and Sajida Zulfiqar were also part of the outgoing NA. Sindh Assembly has 61 general seats with 14 seats reserved for women. PTI has won 15 seats from the province and according to formula a party winning 4.35 NA seats is allotted one reserved seat. PTI would get three reserved seats from here. From Sindh, PTI Karachi Women Wing President Saima Nadeem, Ghazala Saifee and Nuzhat Pathan would be able to reach parliament. From Balochistan, the PTI has won only two seats and from this province a women reserved seat is allotted on winning four directly contested NA seats. So PTI would get no seat from Balochistan. There are a total of 10 NA seats reserved for minorities. Seats for minorities are not allotted on the basis of representation in the provinces. In the House of 272 directly contested seats, a seat reserved for minorities could be obtained by winning 27.2 general seats in NA. In total, PTI has won 116 NA seats and its share would be four out of total 10 minority seats. According to party’s priority list, minority representatives including Lal Chand Malhi, Shunila Ruth, Ramesh Kumar Venkwani, and Jai Parkash Ukrani would be joining the next national assembly through PTI platform.